Hosta sieboldiana Elegans HUGE LEAVES Seeds! 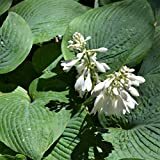 Hosta sieboldiana for sale – Easy plant to grow with edible leaves, mostly grown for the ornamental leaves or flowers and planting in spring to summer, better to buy plant or bare roots. Leaves in elliptic to heart shape, leaves appear in green to blue color.